3) Oh, wow! I’ve always wanted to do that. The people in the first category are probably the smart ones who have a respectable job which earns them respectable money so they can pay off their respectable house and raise their 2.2 kids. The people in the second group are delusional if they think a rough story idea, which can be communicated in two minutes or less, will still be viable when given to someone else for them to write (and even more delusional if they think that entitles them to part of the royalties). But it’s the third group I would like to address the rest of this blog post. If you want to write a book, make sure you are doing it for the right reasons. It is not a quick task, it will not bring you unimaginable wealth, and you need to ignore all the people who use J.K Rowling as an example of success; she is just one writer. The fact is, most debut authors will receive an advance when they sign with a publisher (often around $5000), but many will not make enough in royalties to ‘earn back’ their advance. This means that they have not sold enough copies of their book to match the advance figure and will receive no further payment from the publisher for that book. Which would be okay, if a book could be written in a weekend. It can’t. A writer will often spend months developing the book (a fancy term for focused day-dreaming), then a few more months writing (which involves lots of cups of tea and the occasional outburst which almost ends with the laptop smashed on the floor), then even more time editing. This is how a writer spends the majority of their time. Because despite what we would all like to think, we do not string sentences together as perfect pearls of artistic wisdom. 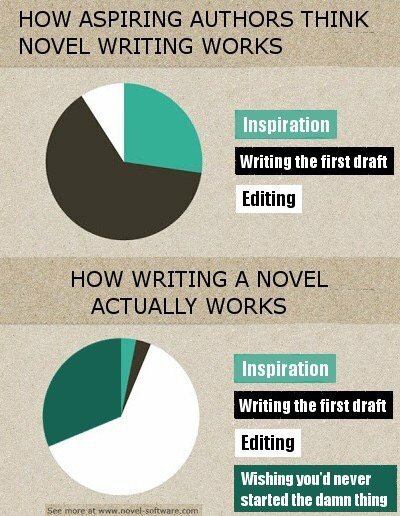 The first draft is never the same as the final product. It’s a hard slog. But, if you can live with everything I have told you, and still feel the need to sit in a quiet room to pour out the words in your head, to later change them (and sometimes change them back), then go ahead and write that book. It is worth the effort when you can picture your character bringing the completed (and published) book to your desk. fabulous post! and, almost convinced me to give it a go…. LoL! I know exactly what you mean! Writing a book is a bitter sweet experience. With a recently published novel, I edited my “final” copy two more times.